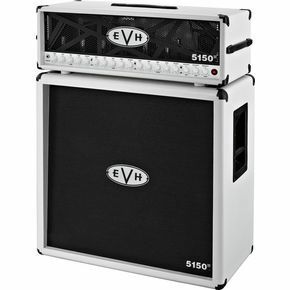 This is what Eddie Van Halen says about his new 5150 III amplifier. Eddie knew tone from a very young age and was always ambitious about getting different sounds from his amps. Guitarists would constantly ask him how he achieved his sound and told Eddie many times that what he was doing wasn’t possible…they were wrong. Eddie was constantly experimenting with the guts of his amps. He adjusted the transformers to lower voltage because he liked the effect it had on his sound. No facet of his amplification escaped his attention or curiosity, right down to the effect that his amp’s grill cloth had on higher frequencies. All of his experience and experimentation has ultimately resulted in an amp that he is proud to have his name associated with. The 5150 III is a professional grade, premium quality all-tube amplifier. The versatility of the 5150 III’s sounds and flexible features allow for the limitless creation of a full spectrum of dynamics and tones. The matching 4x12 speaker enclosure is loaded with Celestion EVH signature speakers. Truly roadworthy and personally crash-tested by Eddie himself, EVH amps feature no-compromise construction, promising peak performance and durability for years to come. Available in black and ivory. Head Specs: 100 watts RMS, 3 channels, controls include: Gain, low, mid, high, volume, channel select and presence for each channel, 4 6L6 output tubes, 8 12AX7 preamp tubes and textured vinyl covering in black or ivory with an EVH striped metal grill. Cab Specs: 100 watts RMS, 4 12” 15-ohm Celestion G12EVH, pop-out swivel casters, and textured vinyl covering in black or ivory.